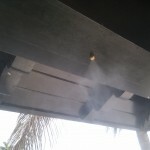 This photo shows a high pressure misting system that was installed during the construction. Our stainless steel tubing was attached to the steel frame before the wood cladding was installed. This high pressure misting system was installed during the construction process in order to hide all of the high pressure tubing. In this example, Misting Direct brand stainless steel tubing with welded nozzle extensions was attached to the steel frame before the wood cladding was installed. Our stainless steel misting pump was installed near the side of the house about 50′ away from the gazebo. The only visible part of this misting system is the nozzles. We worked with the builder to incorporate this system into the design of the gazebo. Contact us now for assistance in designing a system for your unique application. 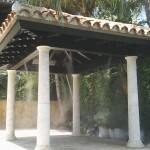 Miami Beach newly constructed gazebo with hidden high pressure misting system. The nozzles are the only visible parts of this high pressure misting system by Outdoor Cooling Systems. This entry was posted in Uncategorized and tagged hidden mist, high pressure mist, mist system, misters, misting direct, misting pump, misting system, misting system design, new construction mist, outdoor cooling systems, stainless steel tubing. Bookmark the permalink.